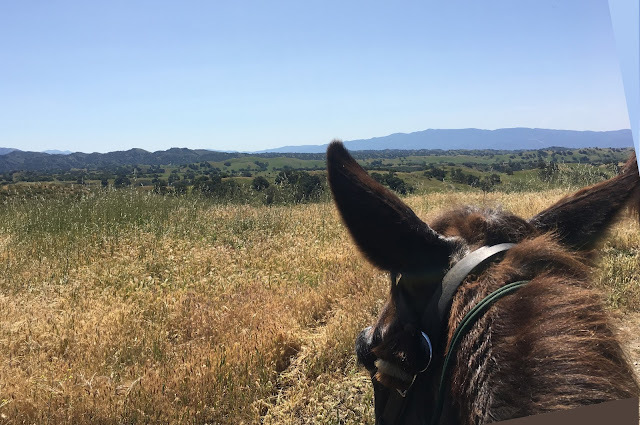 Once again the Santa Ynez Valley Riders were graciously allowed access on the private Brown Ranch in the heart of the Santa Ynez Valley wine country. 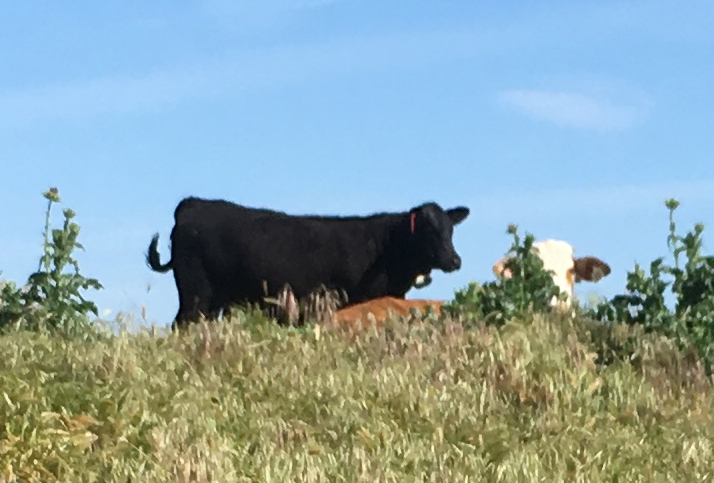 Surrounded by prestigious wineries and historic ranches, this cattle ranch is a slice of the old Californio Tradition, and we were fortunate to take a spring stroll across the magnificent landscape. In all our ride was 4.5 miles done in a 2 hour walk. We went from an altitude of 1,026' to 1,1426', in a leisurely stroll. Our host Lance Brown met us in the meadow where we staged, and welcomed us to the ranch. About two dozen of the club members were along for the ride, and the animals were glad to be getting out and seeing landscape after such a wet winter. And so the trek begins. Past blasted oaks on the hillsides, through grasslands dotted with solitary Coastal Live Oaks, sentinels of the ages, in a landscape the hand of man has touched only lightly by the introduction of cattle. In the hundreds of years these trees have stood watch they have seen the Chumash Indians walk by on their way to the mountains, to collect piñon nuts, chia seeds, and sacred white sage. Then the vaqueros on horseback, driving herds of cattle through from ranchos to the south all the way to the gold fields of the north, feeding the hungry miners driven by dreams of striking it rich. And now, just a few cowboys move the resident cattle from one grazing area to the next, and keep a close watch on fences that protect the valuable grape vines of the neighbors, destined to become world class wines. And how is it that I am so fortunate as to be experiencing this very private hidden gem of a ranch? Why, all thanks to the SYVR club who gain access, and my Kentucky Mule, who is my sturdy legs as we explore the insider locations in California that clubs like the SYVR are so lucky to be invited to see. A moment ago it was a wet winter, yet already the lush grasses are sere and giving way to summer. Their light color contrasts with the evergreen of the live oaks, highlighting the terrain with canyons and ridges where the flora responds to the availability of water and sunlight. With the blue hazed mountains of the Los Padres National Forest in the background, the feeling of timeless beauty and extremely low population density is calming. In just a few minutes from this tranquil place the bustling urban area of Santa Barbara will bring the traveler right back into the present day. today is a stroll through the past. Up on a ridge top several of the resident cattle gaze down upon the slowly walking group of riders. I didn't see any of the horses noticing the cows, but Tobe Mule was quite aware, with his big ears pinned in their direction and his big brain paying attention to this oddity in the environment. Not that I would say Tobe Mule has Cow Sense, he's only worked cattle a few times and the result was more humorous than effective. But he does have Mule Sense, and I rely on it. Next we came to a fence line and looked over into the winery next door. A tidy and controlled contrast to the natural world we have been walking through. And from an elevated point we look out across the valley to the sea, the source of the vital mists and cooling breezes that have allowed this region to gain world renown for the quality of the wines produced under the Santa Ynez Valley AVA, granted in 1983, an American Viticultural Area of 67 square miles. It is part of the larger Central Coast AVA, and contains the greatest concentration of wineries in Santa Barbara County. Just before the end of the ride we came to this idyllic spot, eucalyptus trees surrounding a little lake. After hours in the sun this was a welcome sight, and we stood in the shade a little while letting the animals cool off. Of course, cows are no fools when it comes to comfort, they were there already. And so we moseyed back to the ranch, and another day in the saddle was completed. Thanks to the hospitality of the Browns, for a lovely afternoon well spent.